The United States should be wary of entering into negotiations with North Korea, witnesses told a congressional committee on Wednesday. Under its leader Kim Jong Un, the brutal North Korean regime does not view negotiations as part of the normal interactions of nations. Rather, according to Anthony Ruggiero, a senior fellow at the Foundation for Defense of Democracies, North Korea considers negotiations as only another tool by which to achieve international acceptance of its status as a nuclear-armed power. Testifying before the House Committee on Financial Services, Ruggiero said a strong system of sanctions could force North Korea to agree to weaken its nuclear program. At the same time, he denied that North Korea is currently suffering from strong international sanctions. 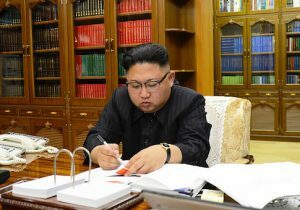 Only 2 percent of United Nations sanctions and 12 percent of American sanctions are now aimed at the "non-national" middlemen and "numerous front companies" that facilitate North Korea’s international finances, while only 27 percent of U.N. sanctions and 47 percent of American sanctions directly target North Korea’s international businesses, Ruggiero noted. Kim Jong Un will stop at nothing to hurt the United States, as the death last month of American student Otto Warmbier showed, and the Trump administration needs to be more realistic and more ambitious in its efforts to throttle North Korea’s international finances. China stands as the fundamental problem for international sanctions, added William Newcomb, a scholar at the U.S.-Korea Institute. He testified on a day in which the Transnational Justice Working Group in Seoul, South Korea, released a report of public executions designed to create an "atmosphere of fear" in North Korea. But the Chinese government has been less helpful than it should be in stopping North Korea’s manipulation of international finance. Numerous proposed sanctions have not been accepted by China, and at the end of June, the United States unilaterally placed financial sanctions on two Chinese citizens and a Chinese shipping company because of ties to North Korea’s nuclear program. The "risk profile" for China must be changed, Newcomb explained. China needs to understand that the United States will act when Chinese citizens and corporations act as middlemen and front companies for North Korea’s attempts to evade international sanctions. The difficulty with this, another witness pointed out, is that "China will not easily be swayed." Elizabeth Rosenberg, senior fellow at the Center for a New American Security, agreed with the need for further sanctions against North Korea, but she added that the United States must use its tools more effectively. Numerous loop holes could be closed, together with better enforcement of sanctions against North Korean mining, construction, and even tourism. The final witness before the House committee noted the difficulty of China as well. John Park, director of the Korea Working Group at Harvard’s Kennedy School of Government, pointed to the extensive use of embassy staff and middlemen in Chinese business. China’s gross trade with South Korea is larger than its trade with North Korea, but Chinese trade with Kim Jong Un’s regime has increased over the years, not declined. Corruption in China helps enable narcotic trafficking and the counterfeiting of Chinese currency, both of which are sources of illicit income for North Korea.